Synopsis: The last thing Tegan remembers is the crack as the gun went off, intense pain, and everything fading to black. One hundred years later, she wakes up. A fast-paced near-future romance. including spending as much time as possible with musically gifted Abdi, even if he does seem to hate the sight of her. But the future isn't all she hoped it would be, and when appalling secrets come to light, Tegan must make a choice: Does she keep her head down and survive, or fight for a better future. 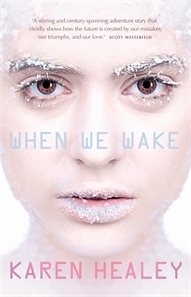 What it's about: Tegan dies at the tender age of sixteen, yet wakes up from a frozen state one hundred years later. The world seems to have made a lot of changes for the better, yet she still isn't convinced about it all. She shows us her journey in a sequence of memories. What I thought: The surreal thing about When We Wake, is that by 2127 our world could be exactly as described in the book. This dystopian-type world is not completely unimaginable and that knowledge will rock you to your very core. Tegan manages to not only survive and accept what she left behind but to adapt to this new world she is brought in to. Her trio of friends give the story an extra boost, making the whole ride even more exciting. Healey has managed to write this story so well, that you can go from feeling like you're part of the story, to simply being an outside viewer without causing any confusion or distraction. For all the lovers of all things sci-fi and dystopian, you will thoroughly enjoy When We Wake! The Good: A dystopian book that gives us a very realistic view of the future, makes reading this book something different. The Bad: While I loved this story, I wished more could have been explained, and the story gone on longer. It felt slightly incomplete. This sounds kind of interesting. I really am interested in novels that take place in the future. Especially if you say that it is possible to imagine the future that way. Great review. I really like the sounds of this. I'll have to see where I can find it.